Even though my Monte Carlo is still a box of toothpicks, I picked up an engine block. It is a Mopar 400 big block. I have been in some conversations with a fella that builds 510 stroker engines using a 440 block. He actually suggested the 400 block, and stroke it to a 451 (or 470), which I guess is a pretty easy thing to do. Take a 440 based crank, some new rods, and some light weight pistons, and bore the block 30 thousands over. They have a good amount of torque, and rev more like a small block. Sadly, it seems my conversations have dried up before I could get a lot more info. So, I am wondering what you all might think if I bounced some ideas off of you. I am used to working on and building engines for things on land, but haven't done much in the way of an inboard boat. I am strongly thinking of using aluminum heads to save a little on weight, and have better flow than the stock heads. I also am planning on have a closed cooling system in place so I don't have lake water running through the engine. Is there any reasons that it would not be a good idea to use aluminum heads in a boat? I plan to make an adapter to run the exhaust logs from a Chevy engine....they appear to be cheaper and lighter than the old logs from the Marine Mopar engines. This was some of the info I was able to get from this fella before he fell off the face of the earth. I assume (I know what you can be if you assume) that a boat this size benefits from a higher torque engine. I am wondering if I need to try and maximize torque down low in the RPM range, or if it is better to also have high torque at a high RPM situation. I am sure there are a lot of questions that I haven't even thought of yet, but we will start with those. Re: Picked up my engine block...now what to do? Sounds like you're going to have plenty of power with whatever configuration you choose for your engine build. There's a real advantage having the engine and transmission on hand early in the build so you can make any necessary adjustments to accommodate the mechanical installation; however, what you seem to be proposing is perhaps overkill for the elegant Monte Carlo design. A smooth running reliable engine with bulletproof drive train is what will make your project practical for its intended purpose. I can't answer all your questions. Maybe, Mr. Hot Rod (Paul Kane) or Jenko (Peter Jenkins) will jump in. They know this stuff for sure! With a closed system I see no problem with aluminum heads. Boats are always under load so torque is really more important than HP, especially on the low end. You are going to have plenty of both. Without any weight or HP numbers I think you're easily in the 45-50 MPH range. In a boat that size I don't think the difference in weight will be an issue, +/- 1 MPH. Thanks for the replies! I forgot to add roughly what the power would be at the crank. A moderately built 451 on an engine dyno will turn about 500-520 hp, and about the same amount of torque. The engine is designed to be non stressed, so I hope to make it durable and able to run for many years. I am not sure if the marine manifolds are a bit restrictive, and guessing the transmission will take some power, but it should be good enough to push a 27' Monte around the lakes. I did mean to expand on the aluminum heads. It will help slightly with weight, but it might actually be cheaper or inline purchasing aluminum heads vs purchasing the iron heads I would use, and do the machine work on those. I did talk with the machinist I am going to use to clean up the block, and he recommended going a bit bigger on the bore due to using it in a marine state. For instance, my bore will be 4.375, and he is planning on adding an additional thousand or so clearance. One thing I am not sure of is what oil pan to use...guessing even though this a shorter engine, I will have to run a low profile pan to fit under the cowling. To that extent, I am guessing I can't run a dual tunnel ram EFI intake system either! I do plan on making it EFI for good tuning abilities. I am also starting to wonder what transmission I should use with this...being that I am not positive of what the total HP and torque will be, I hate to locate a transmission that won't be up to the task of driving it. It may be more cost effective to find a complete marine engine (includes transmission, mounts, bellhousing, drive coupler, manifolds, engine mounts, raw water pump, cooling system etc) and rebuild the engine and transmission. You can refer to our website's Transmission Page for links to specs and suppliers for ZF, PCM and Velvet Drive Co-axial, Down-Angle and V-Drive transmissions. We've also included links to suppliers for performance transmissions, engines and engine packages. 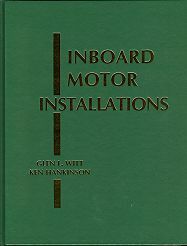 To help you with your engine installation, you may want to order Glen-L's book Inboard Motor Installations by Glen L. Witt and Ken Hankinson. It covers all aspects of engine installation. It's still a blast to see the Hot Rod on the cover of one of Glen's books ! A great momento of Fergal's Cracker Box. Chrysler built a lot of marine version inboard V8s: 273, 318, 340, 360, 383, 426, 440. So I am sure you will be able to find parts. I think they may have even build a 400 marine version, can't recall for sure. if they did they must be rare. I have seen many 440s and a few 383s and a couple 426s although it was not a hemi, but earlier version of 426. You would need to find out what the bolt pattern is for the bell housing. I suspect that it would be the same as a 440, but this would have to be verified. If you join a web site for chrysler big block enthusiasts I am sure the information would either be posted, or if you posted this as a question you could get your answer. If a 440 marine bell housing that mates to a borg-warner velvet drive marine transmission could be found, then that would be what you would need provided you verify that it will bolt up. The most economical way to go provided the 440 bolt pattern is common, might be finding a 440 marine engine with one already attached. It might have some other things attached that you might be able to use that would be a bonus, such as closed cooling system, marine transmission, flex plate (coupler), marine water pump, marine exhaust manifolds. Another thing you will need to research is whether the flywheel on your engine is suitable to mate to the flex plate (coupler) and marine transmission. If you did have a parts motor with these items then it would give you a point of reference. If you went with the borg-warner velvet drive marine transmission you would want the 72 series as apposed to the 71 series. Generally the 72 series is for big block V8 power and the 71 is for small block V8. I understand that the chrysler 400 is a very good and sought after motor. One interesting thing about the marine V8s to consider is the operating RPM. I have a chrysler marine 340 small block and the recommended max RPM is around 4000 to 4400 maximum. That said the marine version of the 340 chrysler uses 318 heads from the factory. This is because the 340 heads used in automotive engines have larger valves that are made for higher RPM ranges that the marine engine will never see. The smaller valves on the 318 head provides faster more turbulent air fuel mixture flow into the cylinders which gives better low end torque. If the larger 340 heads were used the motor would have poor low end torque which would not work well in a marine application. A marine engine if often run full throttle and it is at full load when this is done, hence you want a transmission and propeller pitch and diameter size so that at full throttle the engine will reach the recommended maximum RPM and then level off without exceeding it. This set up is generally with only the driver in the boat with minimal gear (weight). This way the engine will never over rev and with more passengers and weight the rpm will go down slightly. If the engine was allowed to rev to high it would not last very long. It is not like a car where you rev out at 6500 rpm at the top of each gear and then when you reach 60 mph in top gear the RPMs drop off as your speed levels out and the load on the engine drops of as you are no longer accelerating. At top speed in a boat the engine is a full load and remains at full load. I suspect you will want a 1:1 transmission ratio if the boat is more of a speed boat and not heavy. The 72 series velvet drives have an output flange that is on center with the engine crank shaft so the engine would have to be angled would require an angled shim under the carburetor to keep it level. You may want to investigate using other marine transmissions with an angled output shaft so that the engine can be mounted level or at a smaller angle. As mentioned by others in their reply the "Inboard Motor Installations" book from Glen L is a good book to consult. Your alternator and distributor and wiring will need to be marine rated. Have fun with your project. Thanks for the replies everyone! I greatly appreciate the links you provided! I do have the book, but must confess, I read it when I first got it, and then forgot about it and tucked it away on the shelf. Will have to pull it back down and peruse it again! The 400 is a low deck engine, so shares some parts with the 383 and the 440. The engine I have doesn't have a flywheel, so I get to choose that along the way. I am currently looking at using older 516 iron heads that were found on the older 440's, and weighing that option of getting some smaller aluminum heads to help keep the torque down low. To me, it is a bit more fun to try and piece things together...there are certainly frustrating times, but seems more of an accomplishment to me if I am able to pull it all together. Having said all that, it would benefit me to grab a complete marine engine to get some parts off of it.